Rolls-Royce has won an order for its Trent 1000 engines to power ten Boeing 787 Dreamliner aircraft. The deal is valued at $450m (£324m). Headquarted in Dublin, AerCap is a global leader in aircraft leasing and has lodged the order with options for a further five Trent 1000-powered 787s. The aircraft will be powered by the latest version of the Trent 1000, the Trent 1000 TEN (which stands for Thrust, Efficiency and New Technology), which entered service in November last year. 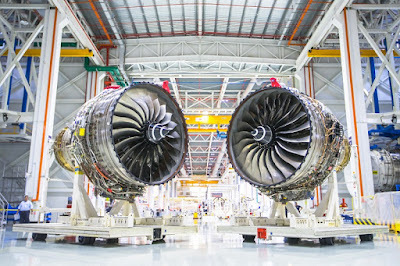 The engine incorporates technologies from the Trent XWB and Advance engine programmes contributing to the Dreamliner achieving a 20% greater efficiency than the aircraft it replaces, as well as having half the noise footprint of previous-generation aircraft. The Trent engines include key components manufactured by Rolls-Royce in Rotherham. The turbine blades made in Rotherham rotate at 12,500 rpm, with their tips reaching 1,200mph – nearly twice the speed of sound. At take off each of the engine's high pressure turbine blades generates around 800 horsepower per blade - similar to a Formula One racing car. The most advanced turbine blade casting facility in the world was officially opened on the Advanced Manufacturing Park (AMP) in Rotherham in 2014. The 150,000 sq ft facility employs around 150 people and has the capacity to manufacture more than 100,000 single crystal turbine blades a year. The advanced turbine blade castings are produced for the company's most modern, high-thrust engines. There are two types of turbine blade manufactured at the Rotherham facility: high pressure (HP) and intermediate pressure (IP) single crystal blades. There are over 65 in every iconic Trent engine and 182 turbine blades in each Trent XWB engine. Dominic Horwood, director – customers and services, civil aerospace at Rolls-Royce, said: "We are proud to have AerCap, a global leader in the lessor market, order further Trent 1000 engines as our latest variant goes into service. We continue to see customers recognise the economic benefits of our engine and its service support." Philip Scruggs, president and chief commercial officer at AerCap, added: "We are pleased to provide our customers with the most modern, fuel efficient aeroplanes and engines in the world. We look forward to receiving further 787 Dreamliners powered by this latest version of Trent 1000, the Trent 1000 TEN engines." The TEN version of the the Trent engine was introduced in an effort to overcome several performance and reliability issues.